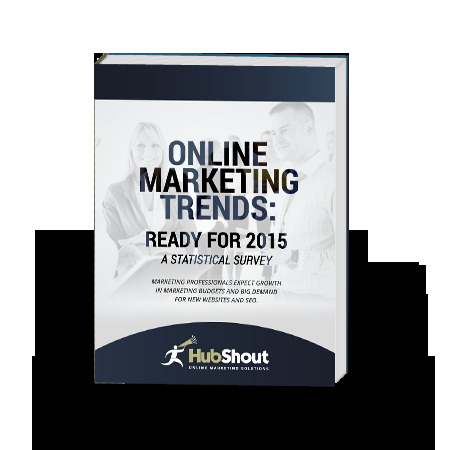 In December 2014, HubShout conducted an online marketing trends survey to help digital marketers prepare for 2015. It won't be long before we start looking at 2016 online marketing trends! But the online marketing trends stats from late last year are very relevant to digital marketing sales that are underway right now. Countless studies have been conducted to find out where large businesses spend their billions of advertising dollars and what they expect from investments in various types of digital marketing. However, the studies have largely ignored small businesses. Small businesses budgets do have meaning for the industry, especially when you consider the combined marketing budgets of 28 million small businesses that currently operate in the U.S. This 2015 online marketing trends survey is an important one because most digital marketers and SEO providers service small businesses. The eBook, based on the survey released in January 2015, was designed to help small to mid-size marketing agencies and SEO resellers understand the trends and provide the data to plan help them plan their lead generation and sales strategies. Furthermore, knowing what small businesses think about online marketing, what they believe works, and what services are in demand helps marketers fortify their sales presentations. As a digital marketer, it’s helpful to know where you stand in relation to other agencies, in terms of revenue and number of employees; that’s where we began our survey. 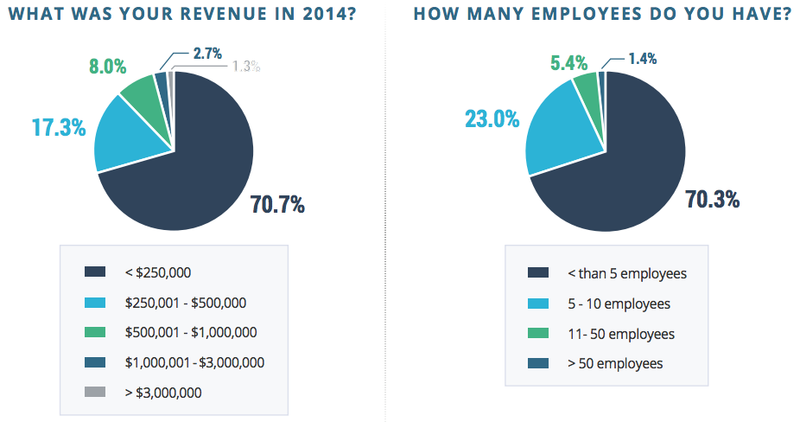 The majority of survey respondents had less than 250k in revenue and fewer than five employees. Walt Disney Co, American Express, Toyota and other big companies spend billions on advertising and and much of that is invested in digital marketing campaigns. In the case of small companies, marketing agencies are faced with budgets in the thousands and sometimes less. But that’s OK! It just means that small marketing agencies need to bring in more clients. What’s easier than that? So many things are easier than that! But, listen to Chris, a top HubShout reseller, (we can only identify as “Chris”—we’re a white label SEO reseller after all! ), talk about how he’s gotten thousands of clients. Not only that, but he thinks small businesses are the best SEO clients, and easier to work with, provided you choose the right vertical. This from a guy whose team has landed big clients like Home Depot and Walgreens. 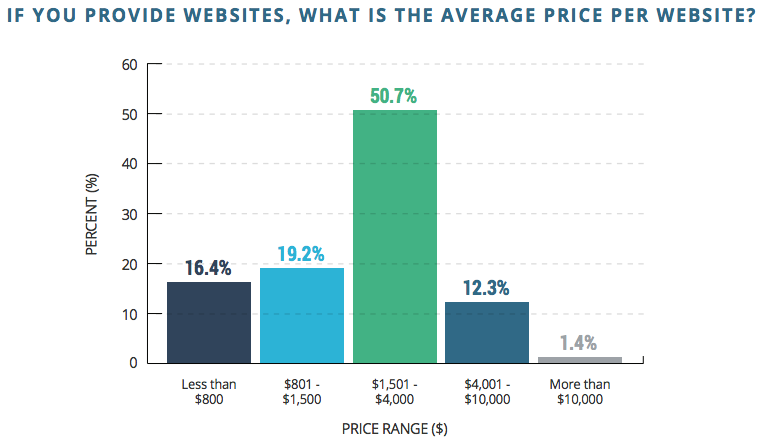 In 2014, most small businesses put a big chunk of their budgets toward website development and SEO. SEO is in demand—that’s reassuring to those of us who are selling SEO. 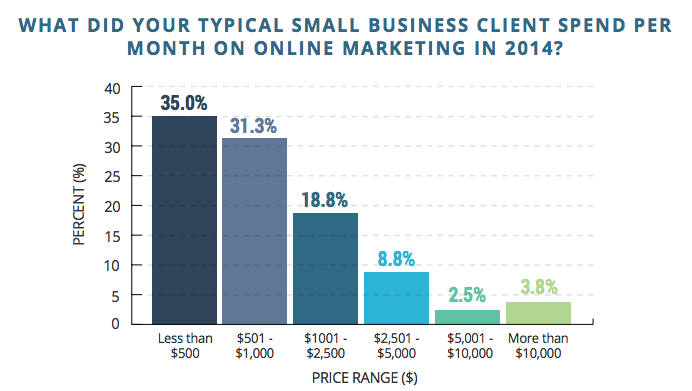 Small businesses are less likely to invest in PPC, Social Media and Email Marketing. SEO and websites are likely an easier sell than the other services. Knowing this, a marketer will need to be prepared to make a strong case for why a client should opt for PPC, social media, email marketing, and/or native advertising—if, that is, the agency believes any of those services are warranted for a particular client. A recent survey by Simply Measured is a good indicator of what clients expect from a social media campaign. Most in the digital marketing industry would probably agree that SEO isn’t a standalone service anymore. An SEO campaign without a social media component is destined to be an underachiever. Many digital marketing agencies are bundling SEO with other services and charging a flat rate. When small business owners contemplate how much they should spend on SEO, they should really be advised to think about SEO as part of a diversified marketing campaign. 72% of online agencies say their clients’ marketing budgets will increase in 2015, some of them significantly! Small Businesses are Looking for You! Digital marketing agencies that offer SEO have the most in-demand service for 2015, according to the survey. 67% report that they expect SEO to be one of the top three most in demand services in 2015. Agencies should have a reliable team standing by and ready to execute the SEO campaign as soon as a client signs up for SEO services. It took a while for small business owners to understand the importance of having a website. It’s taking even longer for them to understand the importance of making sure the website looks awesome...or is at least presentable. Presentable meaning it doesn’t scare people away! So many small business websites (and even some big business websites) are not worthy of an SEO campaign because anyone who lands on that website is more than likely going to hightail it out of there. That’s not good for the business or the SEO provider. So it is nice to see that small businesses are investing in websites. Most are spending between $1,501-$4,000. Not bad! Survey Says: 58.6% of agencies outsource SEO, for very good reasons. SEO reseller firms research, test and find the most outstanding tools and other services that help the small agency deliver on its promises to clients. 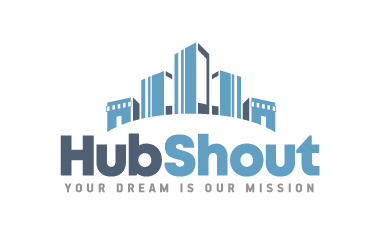 For example, HubShout uses Yext for local search marketing and PRWeb for press releases. Small marketing agencies benefit from our relationships with those services. In addition, SEO reseller firms typically offer an efficient dashboard and some develop even more advanced tools—the HubShout web grader, for example. Leads are, by far, the biggest challenge for marketing agencies. All of the above are important, but if the lead flow is non existent, or dries up, a marketing agency won’t be around for long. And an agency that’s hired a staff of people to deliver services (instead of outsourcing) has another problem on its hands—layoffs. Once again, our reseller Chris has excellent advice. In this webinar, Chris outlines several concrete steps an agency can take to get leads flowing. Other challenges, like technology, employee skills and service/product effectiveness and quality can be easily overcome by outsourcing at least some of the functions of a marketing agency. As mentioned above, 59% of agencies outsource SEO because it is labor intensive and requires a level of staffing that most agencies cannot support. In terms of competition, it's tough to go up against an marketing firm that is outsourcing SEO and other services to a reseller agency that has a reliable and well-trained team of professionals standing by to handle the work demand as it ebbs and flows. 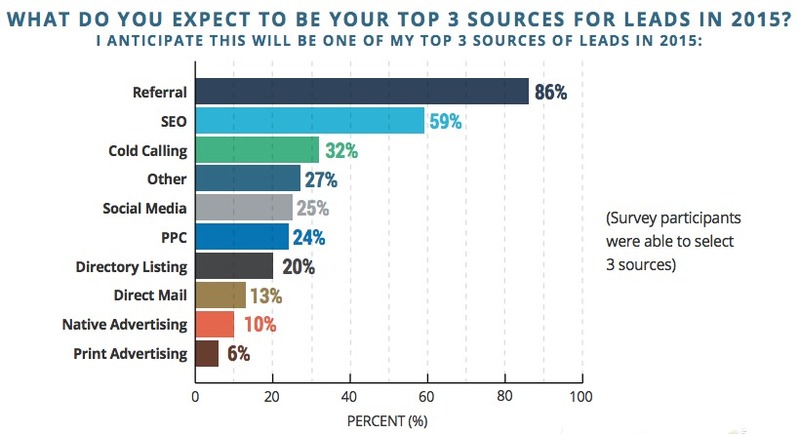 86% reported that referrals are one of their top sources for Leads. Agencies that get referrals have a proven track record—someone has been pleased with their service. If you don’t have a success story yet, what then? Once again, our reseller Chris has some great advice on how to overcome that problem. SEO is a very strong source of leads. Other lead sources are not always so strong but that's doesn't mean they should be discounted. They all have the potential to generate leads—leave no stone unturned! In December, we will conduct a follow up survey to identify online marketing trends stats for 2016. Watch for the 2016 Online Marketing Trends report coming in January. THE 2016 ONLINE MARKETING TRENDS REPORT is available now! Click here.